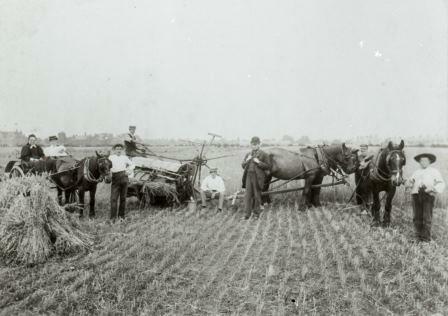 Tuesday 28th May 1918: Farmer John Dancer of Leighton Buzzard has appeared today at the Petty Sessions charged with permitting foodstuffs to be wasted. Proceedings were taken at the direction of the Ministry of Food. 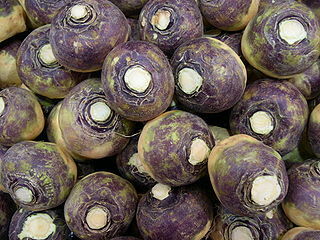 The Beds War Agricultural Executive Committee arranged a routine inspection of Mr Dancer’s farm at Heath and Reach on March 12th, and found a very large quantity of swede turnips lying about in fifteen small heaps, each containing about 1½ cwt of the vegetables. Mr. Dancer stated that he had pulled the turnips last November and covered them with leaves, but had not put any earth on them. Many were found to be frost bitten, and at least half were useless as food for either man or beast. Two other witnesses confirmed the poor state of the turnips, with one in no doubt that it was “simply the result of sheer carelessness”. Mr. Dancer said he took the farm ten years ago and it was managed by his son William. He had heard that turnips kept better in small quantities and were not affected by cold or wet. Both he and his son thought the best way to preserve them was to cover them with leaves. However, another farmer, John Hopkins, stated that the best way to keep swedes was to cover them with dirt. Two other witnesses spoke on Mr. Dancer’s behalf. 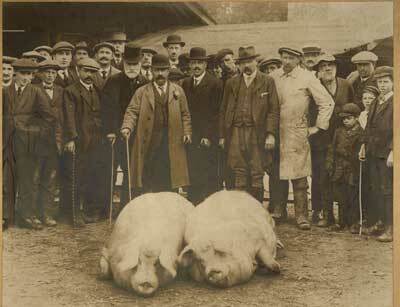 Walter Mills said he had bought some of Dancer’s turnips to feed to his pigs and none were bad. Another farmer, Arthur Syres, had also bought some of the swedes and their condition was “very fair for the time of the year”. After some consideration the Bench found Mr. Dancer guilty and imposed a £5 fine. 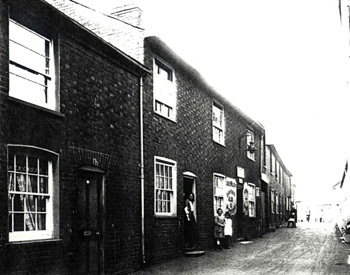 Mrs. Quick lives at 92, Bassett Road, Leighton Buzzard. Her son was twenty years old and serving with the 11th Entrenching Battalion of the Middlesex Regiment. Private Quick is buried at the Duisans British Cemetery at Etrun, near Calais. Thursday 23rd May 1918: A pig raising scheme in operation in the Queen’s Park area of Bedford is looking extremely promising. The Queen’s Park Pig Club began with a meeting held on March 19th to discuss setting up a society for the purpose of buying, breeding, housing, feeding and fattening pigs, with each member to receive a share of the bacon produced. Twenty members contributed some capital, and during the Easter holiday they built two large pigsties with brick floors in Quenby’s field, off Bromham Road. Alongside the sties they also put up a building for storing foodstuffs, with a copper for boiling the feed. The idea rapidly became very popular, and within four weeks of the initial meeting the Club had acquired seventeen pigs and had around sixty members, many of whom are employed at the Queen’s Engineering Works. On joining the club each member pays £3 to cover the cost of buildings and the purchase of pigs. There are already plans to build four more sties, each with a sleeping apartment and a forecourt. Members pay a weekly subscription towards the cost of feeding and looking after the pigs, including the services of an experienced pig-keeper. A collecting tank has been bought and swill is to be collected from the Club members’ houses and from the Allen Institute. The Club has also reserved a plot of ground on which to grow food for the pigs. Manure produced by the pigs is to be sold to the members at a nominal fee, which will no doubt benefit their allotments. Liquid manure is being collected in a sump, so that nothing is wasted. A member of the Club is a well-known local butcher, who will provide advice and experience when necessary, and it is proposed to insure the pigs. Each member is expected to receive half a pig in the autumn. Any profits from surplus meat will be used to replenish or increase the stock of pigs. Proposals have also been made for a Pig Club for the east side of town. This club proposes to set a minimum membership of sixty. The cost of building sties is thought to be prohibitive, but premises suitable for fifty pigs are available to rent. At the current time another forty names are required to make the scheme viable. It appears that Corporal Kendall had helped to make the machine, and the mark of Private Doughty’s father was on the spokes of the wheel. 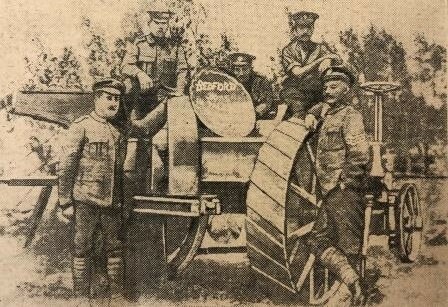 Private Doughty writes that the tractor, which was sent out to Palestine eighteen months before the War, was in fairly good order except that the cylinders had been removed. This is a similar rate to the wages recommended for 16 year old boys. 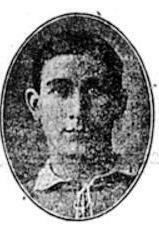 Tuesday 14th May 1918: The news was received today by Mr. S Arnold of 44 Kenilworth Road that Luton Town footballer Arthur Wileman has been killed in action. Mr. Wileman’s wife had lived at that address for some time both before and after her marriage; she is now at her home in Somerset. No further details have yet been received. Arthur Wileman came from a footballing family at Newhall, South Derbyshire. He began his career with Newhall Swifts, before he and his brother joined Burton United, where they gained reputations as dangerous forwards. From there they moved to Chelsea, but were not successful there and after two seasons they moved on. Arthur spent a season with Millwall before joining Luton Town in 1912. Although on the small side he was a strong player with great shooting power. In 1913-14 he scored 33 goals for the club, becoming their second highest scorer. He was one of eight men from Luton Town who joined the Footballers’ Battalion in December 1914. Due to an injury to his knee he was not sent to France until 1916, when he transferred to the Royal Sussex Regiment. In February last year the Club Secretary received a letter from him from the Front, where he was serving with another Luton player, Arthur Roe. He was promoted to acting sergeant major, and just before Christmas was awarded the Military Medal for gallantry. He turned down the offer of a commission, preferring to remain in the ranks. Saturday 11th May 1918: Over the past week Bedford residents have enjoyed a varied selection of entertainment at local cinemas and theatres. Since Monday the Empire has been showing ‘The Garden of Allah’, by Robert Hichens, which boasts that its “desert scenes, with their loneliness, great space, and sand storms, leave an ineffaceable impression”. 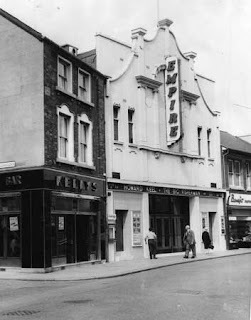 At the Picturedrome ‘Mary Girl’, the “celebrated vaudeville theatre play” has been followed by George Walsh in ‘This is the Life’ and ‘Strictly Business’, number ten of the O. Henry stories. 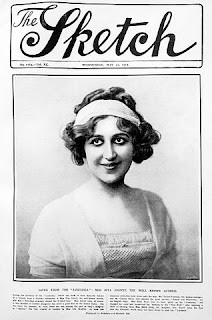 Viewers at the Palace in the High Street were offered a double bill on Monday, with Mary Miles Minter in ‘Charity Castle’ and a two reel Triangle-Keystone comedy, ‘A Hindu Hoodoo’; on Thursday there was a showing of ‘Quo Vadis’. 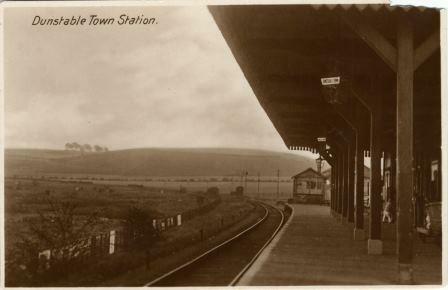 Wednesday 8th May 1918: Three young women have been fined for fare dodging on the London and North-Western Railway. Linslade Police Court heard that on 27th February Elizabeth Maud Vincent, of 52 Wing Road, Linslade, and Daisy Sutton of 10, Summer Street, Leighton Buzzard arrived at Leighton Buzzard Station from Dunstable. When asked for their tickets as they were leaving the station both young women said they had lost them. They claimed to have walked from Chaul End, where they work in a munitions factory, to Dunstable, and to have booked their tickets there. 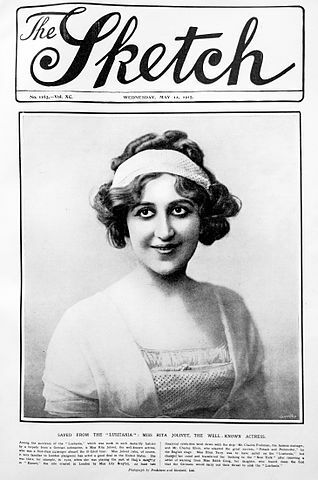 When inquiries showed this was not true, Vincent admitted she had used her brother’s weekly ticket while he was on night work, and had not paid the fare either way. Sutton said she went to Chaul End with her sister Mabel; when she returned she had borrowed her sister’s weekly ticket and had also not paid the fare. Daisy Sutton and Elizabeth Vincent were fined £1 5s.6d. and £1.15s.6d. respectively for travelling without tickets, and Mabel Sutton was fined £1.0s.6d for transferring her weekly ticket to her sister. Vincent told the court “I know this sort of thing is being done by other girls”. Monday 6th May 1918: An inquest has been held at the Bedford Police Station into the tragic deaths of Cadet Malcolm Peter McLachlan of the Royal Engineers, and Winifred, the sixteen year old daughter of Mr. E. A. Gilbert of 7 Offa Road, Bedford. 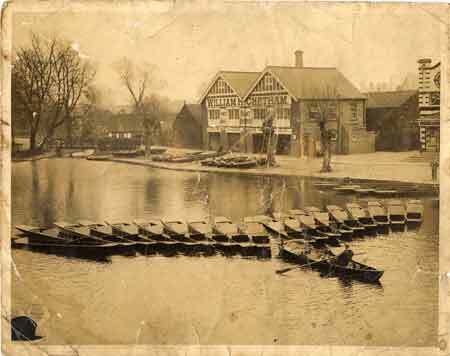 Thomas George Cox, waterman for Messrs Chetham, told the inquest that the young people had hired a three-seated canoe from him at 8.30pm on Saturday. Cadet McLachlan took the stern seat, the young lady the seat in front, and the front seat was empty. Both were paddling the canoe. The river was normal, perhaps a little faster than usual, but boats had been out all week. About twenty minutes later he heard that two people were in the water and took a boat out. He found the canoe had floated across to the opposite bank, the right way up but full of water. The paddles were floating some yards away, and the backboards and cushions had been picked up by a punt. Mrs. Huckle of 10, Pilcroft Street stated that she was walking along the path through the Cattle Market when she saw the couple in a canoe. The lady leant forward as if reaching for something, the boat swayed and tipped over, and both occupants went into the water. The girl was not holding a paddle and the gentlemen was not paddling – they were just letting the canoe float. After the canoe capsized the young man first went for the canoe, but let go when he saw the girl go under. He brought the girl to the surface twice and tried to swim with her to the shore. She clung round his neck and they went down together. They surfaced one more time before disappearing. Four other boats were nearby. A sailor and two civilians in one laughed and passed on. Two soldiers in another boat could not swim, but tried to look for the couple. The other two boats rowed away. Charles Hartwell, a waterman, saw the accident from the Cauldwell Road walk. As he entered the Bridge the young man was standing up in the canoe, which was going very slowly. and the young lady was sitting. He insisted that his recollection that the young man was standing was accurate, although it disagreed with the previous witness’s statement. He though the young man must have lost his balance, as he sat or slipped down on the side of the canoe, tipping it over. He said there were “ever so many” boats on the river at the time. The man made for the canoe, the canoe rolled over, and that was the last he saw of them. He shouted to some people in a boat to let him have it to go to the couple, but they moved off. He then sent a young man for the lifebuoy hanging near the bridge, but when he got to the spot with it the couple were gone. He believed if he had the use of a boat he could have saved them. In his summing up the Coroner said it was clearly an accident. That anyone should be so callous as to be nearby and yet not try help was acutely painful; only Mr. Hartwell appeared to have made any effort. It was one of the most painful cases he had ever had to preside over. The Jury returned a verdict of “accidentally drowned”. The remains of Cadet McLachlan are to be taken home to Bootle in Lancashire by train, with full military honours. Miss Gilbert’s funeral is to be held at Bedford Cemetery on Thursday. Saturday 4th May 1918: Bombadier J. Pool of Friday Street, Leighton Buzzard has sent home a French Testament as a souvenir of the war. This volume, which is around an inch thick, contains a piece of shrapnel which passed through one cover but not the other. Bombadier Pool was carrying the Testament in his breast pocket at the time it was hit, and he is in no doubt that it saved his life. A handkerchief which was in the same pocket now has four holes where the shrapnel passed through the folded fabric. 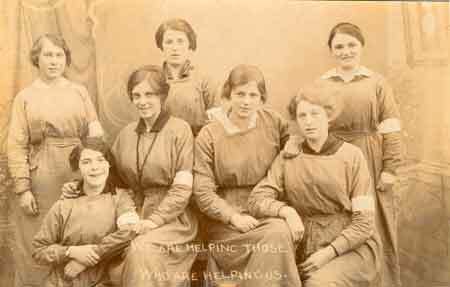 Thursday 2nd May 1918: A meeting of women workers was held this evening in the Council Chamber of Luton Town Hall and a local branch of the National Union of Women Workers of Great Britain and Ireland was formed. The meeting was first addressed by Mrs. Barbara Prothero, who is the honorary secretary of the Union, a leading member of the National Union of Women’s Suffrage Society, and the wife of Rowland Prothero M.P., President of the Board of Agriculture. She told her audience that she had always wanted to start a branch at Luton as she knew that “when Luton people once put their hands to the plough they never looked back”. Mrs. Prothero emphasised the need for greater education for women now that they had been granted the Parliamentary franchise. The next speaker was Lady Cowan, one of the founders of the Women Relief Munition Workers' Organisation, who explained that the Union was non-party, and welcomed women of all shades of political opinion and none, and workers of all types, not just those in industry. The resolution to form a local branch of the Union was carried unanimously.